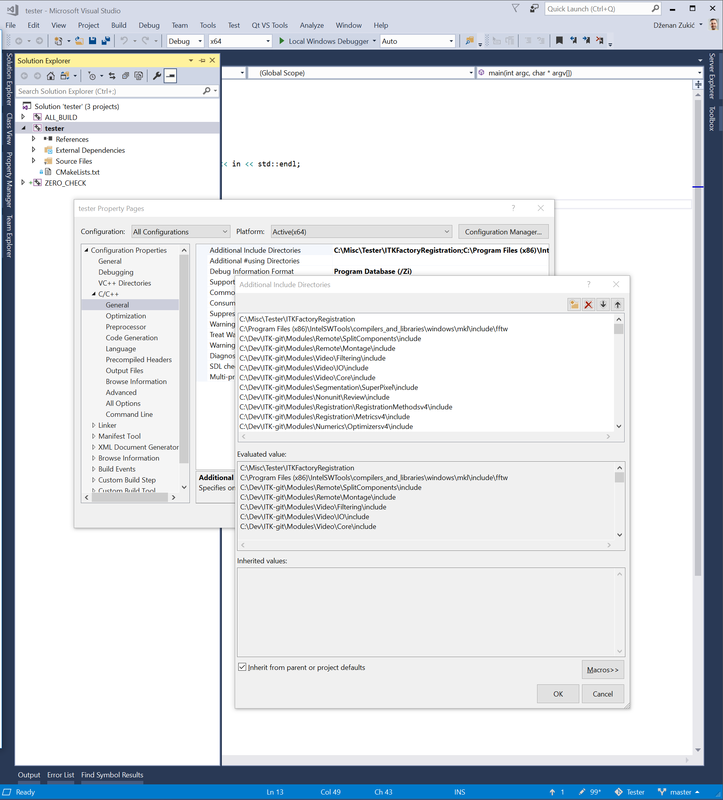 Cannot open source file "itkMultiScaleHessianBasedMeasureImageFilter.h"
I get an error in Visual Studio 2017 when I am trying to include itkMultiScaleHessianBasedMeasureImageFilter header file. How does you CMakeLists.txt look like? The filter you mention is in ITKImageFeature module. Do you have any idea how can I solve that issue? This branch might be taken, thus affecting (not populating) the list of ITK modules. Of course, you need to enable Module_ITKVtkGlue when configuring ITK. Could you please provide any helpful hint? Which version of ITK are you using? Before version 5, that filter used to be part of non-default module Review. Make sure you enable that module when configuring ITK with CMake. 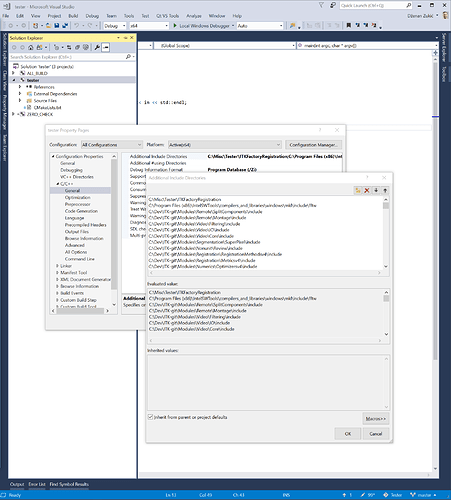 Open your project properties (right click on MaskImageFilter, properties is last option). Go to C/C++, General. Edit Additional Include Directories. See if path\to\ITK-source\Modules\Filtering\ImageFeature\include is in the list. If it isn’t in the list, what is? You can copy the list from Evaluated value box. I have installed the 4.13.2 version, the latest available version on itk website. I tried to add that directory, but I do not have include folder under “Image Feature”, please see the attached image. You are looking in the ITK build folder, not the ITK source folder. But first enable ITKReview module, as I think that is your main problem.